People born specifically on the 14th of June are believed to be chatty, thoughtful and versatile with the impulsive intelligence typical to most Gemini's. The ruling astrological planet designated for this particular day is Mercury, also the planetary ruler of your zodiac sign, making you creative and critical. If you have this birthday talking too much is a consequence of your thirst for knowledge and opinion on absolutely everything. Your sociable free spirit is good at understanding and communicating with others but you are rarely easily fooled. Quick witted, resourceful and adventurous you usually embrace change and welcome challenges and possess a desire to be continually learning and developing wisdom. Individuals with a June the fourteenth birthday have a tendency to hoard interesting things and ordinarily enjoy reading and watching films. Although you are fairly adaptable and crave affection and emotional stability yet when it comes to closeness and intimacy you can be shy. Working life options are often rather important decisions to a person born on the fourteenth of June. A suitable profession is one that fulfills your strong sense of purpose and need for some form of financial security. Your natural intellectual curiosity and skillful perception and comprehension allow you to quickly learn new skills for any job. Scientific or medical type career path choices could be particularly appropriate and enjoyable as they present constant variety and opportunities for progression. Keeping a close eye on finances is essential as you have a probable proneness for impulse buying. For a Gemini, the person born on the fourteenth day of June is untypically a bit of a loner and a tad hesitant about romance and togetherness. A slight mistrust of your inner feelings sees you being choosy over the perfect partnership and taking time to settle into a committed long term loving relationship. You are likely to be physically attractive so inclined to often have more admirers than true friends. Tender, generous, considerate and kindhearted you require a soul mate with similar qualities and romantic expectations who brings out your adventurous fun side. Your ideal partner should be as laid back as possible to put up with your usual oversized collection of possessions and occasional restless moodiness. As you get older you tend to become more emotionally sensitive and so prone to be more sentimental concerning special love unions. The general healthiness experienced by those born on June 14th is once in a while disturbed by periods of mental exhaustion. You have a habit of pushing yourself just a bit too hard and being overly picky with your diet. With your oodles of energy and touch of competitiveness you will find that pacing yourself effectively is the best way to contribute to remaining healthy. Practicing patience is also of great benefit to maintaining stress levels and overall well being. People born on this day will discover that frequent breaks from daily routine provide a fabulous method of recharging your batteries. Your main strengths of character are exposed in the brilliant mix of creativity and versatility you have. These positive traits compliment your sharp wit and sociability giving you an amiable, clever and imaginative edge to your individuality. 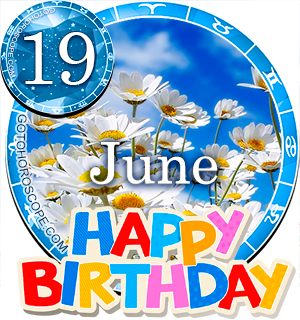 The biggest personality weaknesses for those born on June 14th are your tendencies towards criticism and impulsiveness. Less frequently occurring negative behaviors are your inclinations to act in an overstressed, impatient or domineering manner. If you have extra worries on your mind these disagreeable expressions seem to put in an appearance more often. Being born on the 14th of June makes you likely to have big hopes and wishes for your future but your optimism is often diminished by a fear of failure. You are usually not as self confident of your abilities as many of your twin zodiacal sign counterparts so unlikely to set definite goals. Your resourcefulness helps you combine and concentrate your achievement efforts but you will also need additional encouragement and incentives to push yourself forward. Your continual interest in expanding personal knowledge and collecting intriguing unusual items is a common feature in the content of your dreams. As you were born on the fourteenth day of the month the total of your birth date equates to a Root number of Five. This numerical reference to your birthday has the keyword 'Inquiry' reflecting your passion for information and high degree of curiousness. In the Major Arcana Tarot the 14th in the deck symbolizing Temperance is associated with your birthday. This card represents the modifying of desires to reveal new truths in relation to your fondness of education and also highlights your moody streak. The lucky gemstone for June the fourteenth birthday is Diamond, to be worn for boosts to wealth and happiness. The planet Mercury is assumed to be the most powerful influence on the anticipations of Gemini personalities. The actual day you were born on, the fourteenth of June is astrologically governed by the same planet's dominance intensifying its authority on your probable disposition. Your purposefulness and adaptability is well directed while your wittiness and sense of adventure make you a fun companion. Keeping knowledgeable constantly stimulates your talkative temperament and ensures that you are never usually lost for words in any circumstance. If you can control your touches of impatience, criticism and irritability it could make you happier and you should find relaxing a little easier. A final contemplative thought for people born on June the 14th is to remember to be at your most attentive and flexible to those that you believe love and respect you the most. Prioritizing in life is one of the major keys to ensuring you opt for positive paths to contentment. Guys and Girls, Trump is dead, long live Trump. I vote with my wallet. Trump for 2020!!! Long live Donald trump .May God bless him with unconventional wisdom to deliver America out of many bad policies. i litterally am so happy to be born on the 14th! i think that this was so accurate. i also need to start wearing more diamonds i guess?! Wow I am very happy to be born June 14! I wish my wife can understand this is me. She's still finding it hard to do so and I careless. Trumps Birthday, he is GODS CHOICE FOR PRESIDENT, ALL YOU PEOPLE BORN TODAY HAVE AN OBLIGATION TO VOTE FOR HIM AND SUPPORT HIM! He is the ONLY ONE WHO WILL SAVE AMERICA! I did VOTE.... BUT HE IS NOT SAVING LIKE HE SHOULD>> WE SHOULD HAVE CANADIAN MEDICADE BY NOW>... but the only thing wrong is the companies are in america and love american money, ... CANADA IS WHERE THEY GET THEIR LITTLE ENDS>>NOT DIVIDENDS!!! SO INSURANCE>>LOANS>>FINANCE>>PRIVAT E IRS>>>??? QUESTION THE SEPARATION THROUGH SOCIAL MEDIA>> NOT TOGETHERNESS THROUGH IT>>> CUS IT IS WHAT PEOPLE SAY IT IS RIGHT>>> "ITS UP-DOGS DAY TODAY NOT GROUNDHOGS"
While I love having June 14th as my birthday, I am disgusted that I share it with Drumpf. He is a gross, selfish, horrible excuse for a human, and his policies are as anti-American as they come. He lies and cheats, and treats women like chattel. "God's choice for president"? Puh-leeze! He is an embarrassment to our country. You can't save America drowning the world. It doesn't work like that, sorry. i need to start wearing my diamonds...who knew..
Definitely True.. Sounds amazing why they cope up with this best explanation. Wow this is definitely me. I am spooky happy to be born June 14!!! did you know trump has our birthday too? On point, Insightful, Empowering and oh so Inspirational. *singing* Diamonds, Diamonds are a girl's Best Friend. That is all so true but what if it wasn't! !